45,000 people said they were Orthodox Christians in the last census in Ireland (2011), up from 250 in the 1990s. 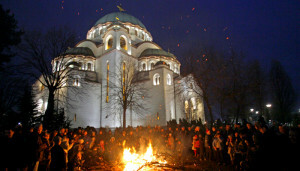 In Ireland and abroad Orthodox Christians are celebrating Christmas from this evening into tomorrow (6-7 January). 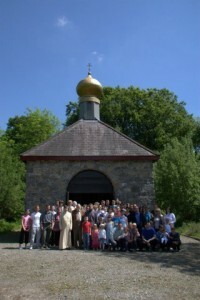 On the Stradbally Hall estate, where the Electric Picnic is held, there is a Russian Orthodox church which serves the local area. Some of this Stradbally community is travelling today to join the Waterford Orthodox community in their celebrations of Christmas. They are also holding a social gathering in the Co Laois village. Another custom they partake in is the giving of presents on St Nicholas’ Day which is on the 6th or 19th December depending on the calendar, for example the Russian Orthodox Church follows the Julian Calendar, according to which the Saint’s day is on the 19th. “It is a celebration of God coming into the world, because nobody knows when Christ was actually born and that is what the celebration is about,” said Adrian Cosby, Church Warden, who was instrumental in the building of St Colman’s Russian Orthodox church in Stradbally. 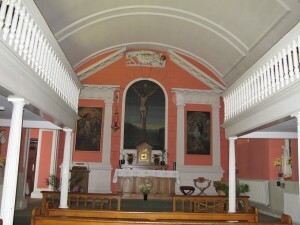 The Waterford parish uses a convent church, St Patrick’s, which is not too far from the Catholic Cathedral and is also used by Polish Catholics and their diocesan Polish priest. Similarly in Cork the Russian Orthodox Church is uses a chapel loaned by the Holy Trinity Church on Father Matthew Quay in the city and the Catholic Diocese of Cork and Ross. Adrian Cosby explained that there are Christmas liturgies in some of the nine Romanian Orthodox parishes and more than six Russian Orthodox parishes in Ireland. At the Holy Apostles Peter and Paul Patriarchal Metochion Russian Orthodox church at Harold’s Cross in Dublin (which is a former Church of Ireland church) the service starts on the evening of 6th and goes on into early next morning. “Russians (Orthodox Church) do it slightly different going back to the Soviet era – because the secret police stopped watching at 12 midnight they tended to have a service overnight,” he told CatholicIreland.net. The liturgy itself has been around since at least the 4th century. Adrian Crosby explained that the Russian and Romanian Orthodox, especially the latter, suffered a terrible persecution when the Communists took over after the last war. However, the Orthodox church survived in both countries. “What was amazing in Russia is that churches that were destroyed were rebuilt again and the icons and things that belonged to them had all been hidden and re-appeared again,” he said. At the moment Orthodox Christians are being persecuted in Bethlehem and Muslim countries where they are driven out of their homes and out of their own areas and countries. Many Church leaders, including Pope Francis, have spoken about this in December and given words of encouragement to the Christians of these countries in the Middle East. In Ireland, the Orthodox Church is thriving. 45,000 people put their religion as Orthodox in the last census in Ireland (2011). When Adrian Cosby started building St Colman’s Russian Orthodox Church in Stradbally in the early 1990s there were less than 250 people of the Orthodox religion in all of Ireland. He said that people joked there was only one in Stradbally. In the early 2000s as Eastern Europeans began arriving in Ireland the numbers grew. Last year for the first time ever there were services at St Colman’s in Stradbally almost every Sunday. The Romanian Orthodox Church members come on alternative Sundays. The Russian Orthodox members have a reading service on one Sunday and a priest comes on the other. After the unification of the Russian Orthodox Church and the Orthodox Church Outside of Russia in 2007, the priests from the Patriarchate of Moscow have visited St Colman’s church and have held regular church services there. With such an increase in activity further facilities need to be built on the site and funds are desperately needed.